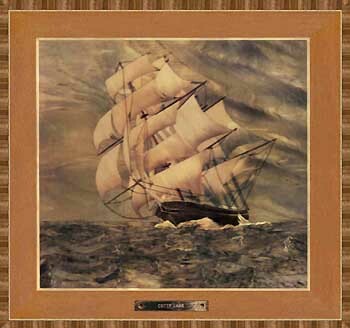 Imagine this scenario: You've just spent weeks making a beautiful marquetry picture of a three-masted schooner with the sails billowing and white foam speckling the heavy swell of the ocean... simply stunning. There's only one problem - your schooner is totally devoid of rigging. So, what can you do? 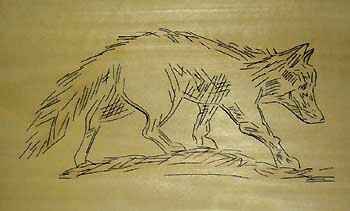 Some people would resort to pyrography, but the true marquetrarian's answer is fine lining. Fine lining is the art of inserting extremely fine shavings of veneer into very thinly cut slots in your marquetry picture. The shavings are garnered by running a modeler's plane along the side of a piece of chosen veneer, so that you end up with a small pile of spirals or watch springs of veneer. These spirals will not be much use to you unless you straighten them out, and that's done in the following manner. Place some of your spirals in a shallow container of water (a saucer is ideal for this purpose) and leave them soaking for a few minutes so that they absorb some of the water. Once they are sufficiently wet, take one of the wet spirals from the water and straighten it out by pulling it gently through your finger and thumb, and then lay it on a piece of blotting paper to dry out flat. It also helps to use a bit of PVA glue on your fingers when pulling through, as they will then stay straight rather than attempting to curl up again later on. Repeat the process for the rest of the spirals. It's a good idea to do more fine line lines than you need, and store the surplus for future projects. 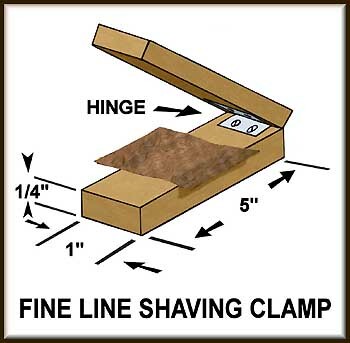 "When shaving a thin "line" from the side of a piece of veneer with a small plane, the thickness of the final line will be dependent upon the setting of the blade of the plane, so do bear that in mind when setting up your plane. "My plane is a small model-making item about 2.5" long and the cutting blade that I'm using is actually a razor blade. I wouldn't recommend using the standard steel blade that comes with normal planes as these blades tend to break the veneer rather than cutting it like a razor blade does. After all, you want a nice clean cut line rather than a jaggedly cut line which couldn't be guaranteed to do the job required of it. The next priority is to try to ensure that you use a straight grained veneer for your fine lines as these will form the preliminary "watch springs" of veneer without breaking into splinters and dust. Now, an important tip when setting up is to wet the veneer first before proceeding on to the next step. Once your veneer is damp, place it between two parallel lengths of wood as shown in the diagram. You can place the clamp in a vice of some sort (a small model makers one would be ideal) and in doing so thus protect your delicate marquetarians fingers from being inadvertently shaved whilst performing the fine line cutting operation. "If your veneer is wet, the lines will uncurl a lot easier when you come to flatten them out before leaving them to dry. When dry, with some grades of veneer, I go over them with some 240-grit paper. To cut the insert line in your picture, make the cut in the same way as you would normally do for the majority of your marquetry work, but this time run your blade back along the same cut with a slight angle on both sides of the cut, so that in effect you make a wider sort of "V". I normally use a pair of tweezers to insert the "line" into the cut. This also gets easier with practice. When you have succeeded in placing your line in the cut, don't drop glue directly on the cut. The secret is another of the little tips that Eric Horne gave me, and that is to apply glue to just one side of the cut and then with your finger gently "roll" the glue along the cut." Thanks for the article, Pete! One point I would like to make is to make sure that you insert the fine line as quickly as possible once the glue has been inserted, otherwise the cut will swell up due to the water in the glue being absorbed by the fibres in the veneer. In the clamping arrangement Peter mentioned, note that the veneer just shows over the top edge of the clamp. You don't want it protruding too much, otherwise it will bend when you attempt to plane it and then you will not get a clean piece of fine line veneer. If you insist on using colored woods, you will find that the base veneer is usually sycamore. It can be dyed by using either water or spirit-based dyes. In practice the spirit based dyes seem to retain their colour better when exposed to sunlight. I would say that if you really do want to use coloured veneers in your picture, then use them very sparingly. Don't let them dominate your picture, or you'd be better off painting a picture rather than using veneers because you will have masked the essential element of a marquetry picture - which is wood, not paint! If you just want to darken veneer, then use the sand scorching techniques we talked about in Lesson 6. If you need a lighter shade, this can only be done by bleaching your veneer. I have to admit that I have had success with bleaching on just a few veneers. I recommend experimenting with some scrap pieces before you commit to applying bleach to your picture veneers. Wear appropriate gloves, masks and aprons, and ensure that you have adequate ventilation when you are working with substances like bleach. Perhaps working in the open air would be the best proposition. I use ordinary household bleach, which I dilute at about one part bleach to three parts water, and then I immerse my veneer in the solution in a large plastic tray. I leave there until the veneer has achieved a level of lightness appropriate for my needs (generally 15 to 30 minutes). 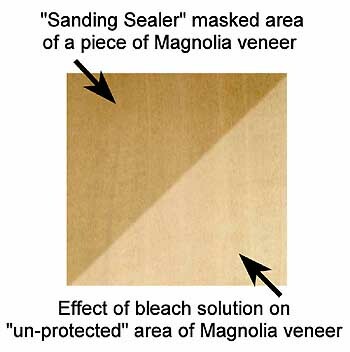 If you require a certain shape for your bleaching effects, you can mask off the sections you want to leave untreated with something like sanding sealer, let the sealer dry, and then immerse your veneer in the bleach solution until you've achieved the effect you require. Once you've removed your veneer from the bleach solution, you will need to nullify the bleach from your veneer. Do this by immersing your bleached veneer in a white vinegar solution for a few minutes and then rinsing the neutralised veneer in clean water and then allowing it to dry before you make use of it. 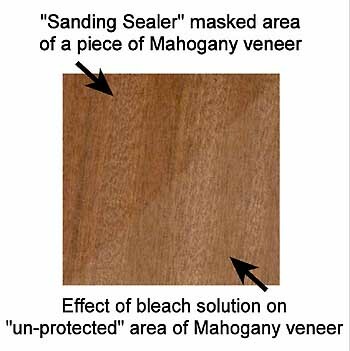 Bleaching also can be used for removing weather stains, as well as many other discolorations from bare wood, but do be sure that it's bare wood or you will end up with a "masked" effect. The only caveat I have to mention with fine lines is that they are generally performed on 1/64th of an inch thick veneers which have been knife cut where the fine line insert is to be placed. What actually happens is that no veneer is cut away: the blade just parts a slit in the veneer into which you insert the fine line. If you are using saw cutting for your marquetry picture, I am afraid that you will have to resort to a blade for this part of the task in order to get the correct effect. You could, if you really wanted, use your saw blade to cut the slit for your fine line, but your final fine line will end up as the thickness of your saw blade and you will not be able to get the very thin lines that you get from using a blade (especially something like an E11 scalpel blade). In our next article, we shall get a little further into colored veneers where we will look at natural colorings and recommend some veneers for certain marquetry tasks. We also will have a look at techniques of blending one veneer into another.